In the 1967 War, the Israeli military attacked and sank the USS Liberty in international waters. 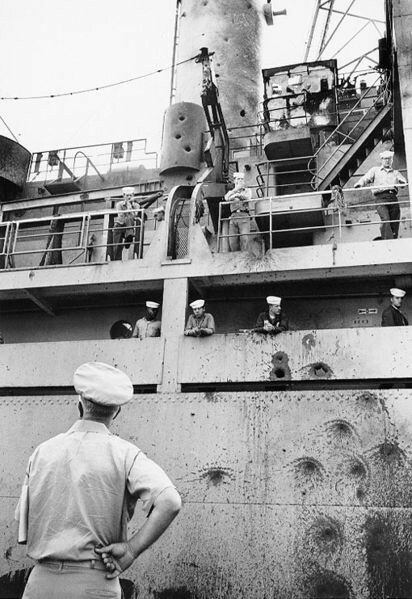 34 US sailors were killed and 174 wounded after Israeli Navy officers mistook the Liberty for an Egyptian ship. The anniversary of the attack was even more poignant than usual this year, as the Israeli navy attacked a humanitarian aid ship last week in international waters, killing nine people including an American teenager. A number of veterans of the USS Liberty attack gathered this week in the US to commemorate the anniversary of the attack. One of the veterans of the USS liberty attack, Joe Medders, was on the humanitarian aid ship attacked last week. In both cases, Israel attacked international vessels in international waters; both the USS Liberty and the 6-ship aid convoy were completely unarmed when they were attacked, and engaged in legal, peacetime activities; Israeli forces attacked people trying to escape in both instances; Israeli forces blocked communications and jammed radar in violation of international law in both cases; and Israeli authorities attempted to stifle any investigation of both attacks.